Hey y’all! Serene from House of Yumm here to amaze and astound you yet again! Remember those Rainbow Sherbet Cupcakes? And the Circus Animal Cookie Popcorn? If you haven’t noticed yet I am a huge fan of sweets, sprinkles, color, and frosting. And I am bringing you a treat today that combines all of those things in one! Plus the holidays are coming up and I looove the holidays. Halloween included. So much fun. I’m not much for the spooky, scary stuff. But super cute pumpkin sprinkles? How can I resist? 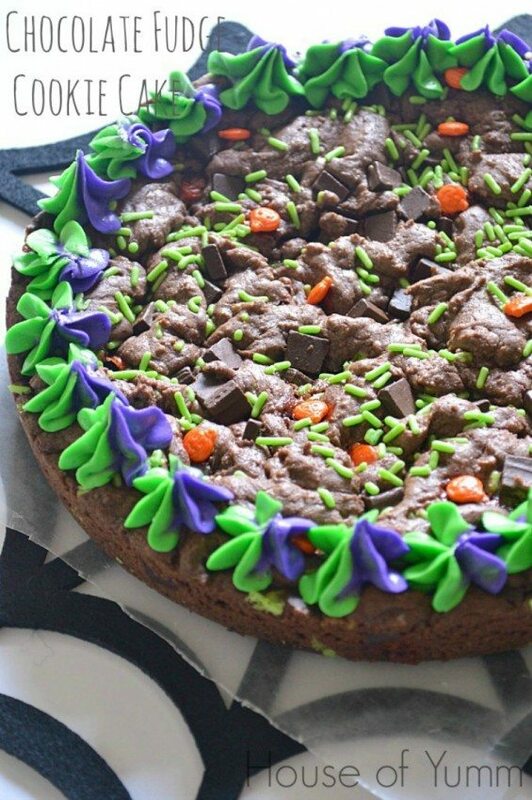 So today I have for you a Double Chocolate Fudge Cookie Cake all dressed up for Halloween. Stores are bursting with Halloween stuff right now. Of course it’s in the aisles next to the Christmas decor, which to be honest, I’m just as excited about. Love Christmas, and it’s possible I go slightly overboard with decorating for that holiday. My husband makes me wait to decorate for Christmas though until after Thanksgiving. If I had my way I would be putting it up November 1st. Back to Halloween, so my youngest seems to be afraid of all the Halloween decorations in the stores. Where we do our grocery shopping there’s this witch that’s about three feet tall and it goes off when you walk by, she laughs and says Happy Halloween. The baby…terrified. She curls up into a little ball and squeezes me or her daddy to make sure we won’t let the witch get her. Meanwhile back at home there was a cockroach, yes you heard that right (I live in Texas), and the baby…loves them. Goes up to them, points, and says “buuuuug”. I think if I let her she would pick him up and take him to play baby dolls with her. I’m not so sure I fully understand this child. As I already stated though, I’m not into the spooky, scary Halloween. I’m not into bugs either though. 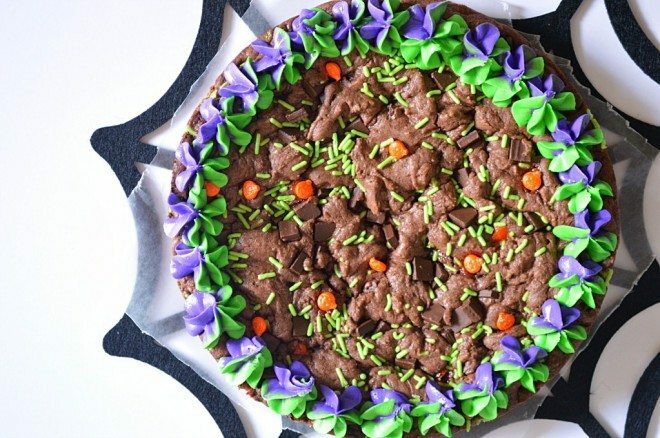 So my Halloween looks like this delicious double chocolate fudge cookie cake. 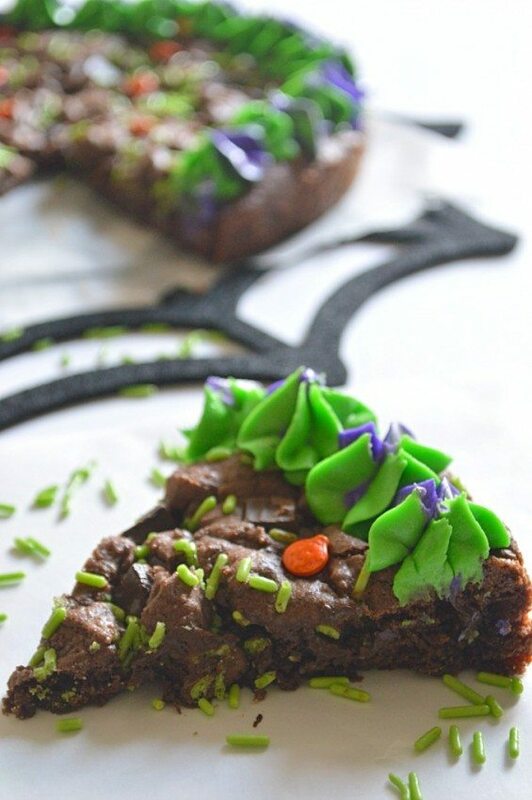 Sprinkled with smiling pumpkins and frosted with purple and green. This is such an easy dessert to make, and so easy to change up and make for any holiday. You can see the one I made for Fourth of July here. I start with a cookie mix, because, well, it’s easy. I have too many kids who are currently too young for me to make everything from scratch. Besides how can you go wrong with a Double Chocolate Chunk cookie mix. Look at all those chunks of chocolate in there! That came in the cookie mix, I didn’t have to add any additional chocolate. I was all prepared to with my bag of chocolate chips on the counter. Then I saw the cookie mix and thought that chocolate chips might just be too much chocolate. You heard that right folks. Too much chocolate. Can such a thing even exist?! The frosting on this cake is super fun, and make sure you check out my tutorial on how to swirl multiple colors together which you can find here! 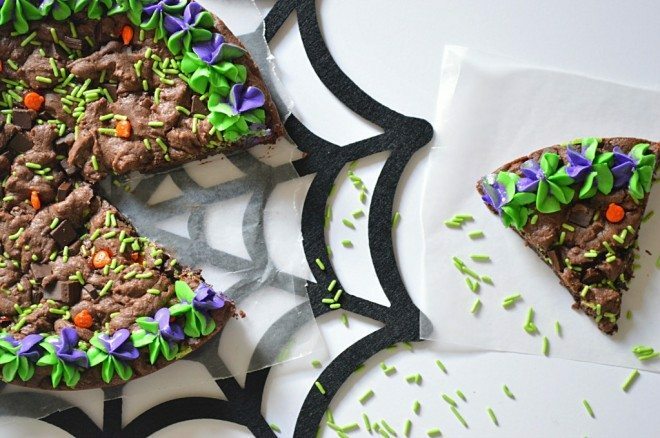 A chocolate fudge cookie cake all dressed up for Halloween. Prepare the cookie mix according to the directions. Add in the sprinkles as desired. Pour into a round greased cake pan. Bake for 20 minutes or until the center is fully cooked. Add all ingredients into large mixing bowl. Mix on medium speed until fully combined and frosting is light and fluffy. Separate the frosting into two equal amounts and add approximately three drops of food coloring (or until desired color is achieved) to each bowl, purple in one bowl, green in another. Add frostings to piping bags, I used a Wilton 2D tip. Squeeze out some frosting on the side to ensure both colors are coming out. Then decorate the edge of the cookie cake! Enjoy! 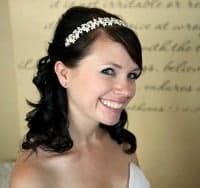 Serene is a wife, mother to three beautiful girls, and lover of all things frosted and sprinkled. During nap times she loves to bake, cook, and photograph her fun creations. 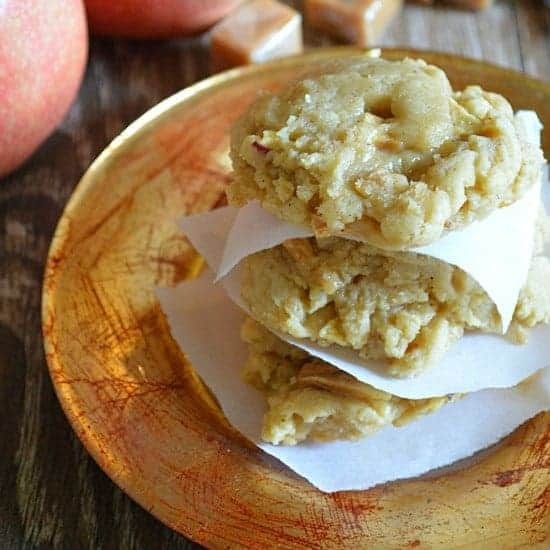 Her blog, House of Yumm, is the place she shares all of her recipes. There you can find recipes that are easy, fun, and creative! 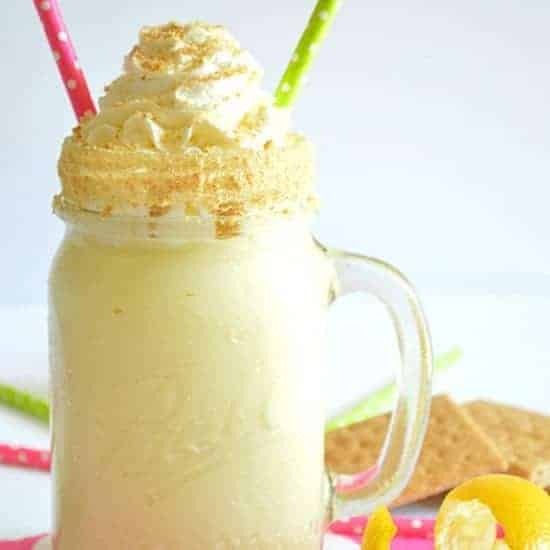 Most are sweet treats, however, since a person can’t survive on cookies and cake alone, there are also some scrumptious meal ideas too. Join her for fun, family friendly, time friendly delicious treats throughout the week! Looks delicious! My kids will go crazy for it 🙂 Pinned! 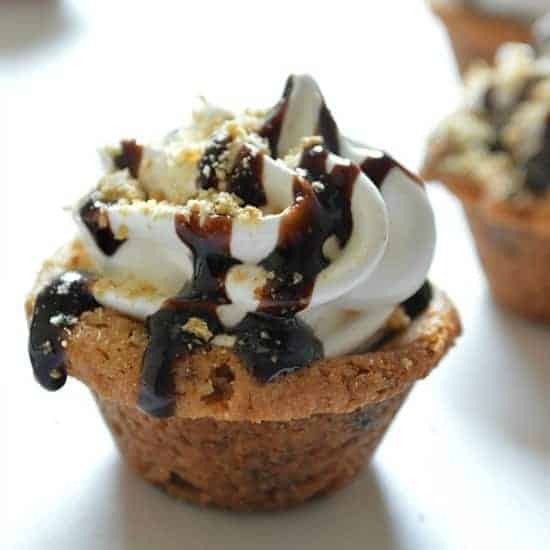 This looks amazing – I just pinned!